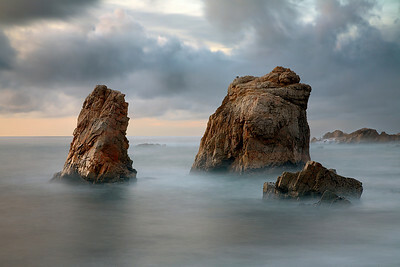 some outstanding seascapes of grand proportions and some interesting rock formations as well. 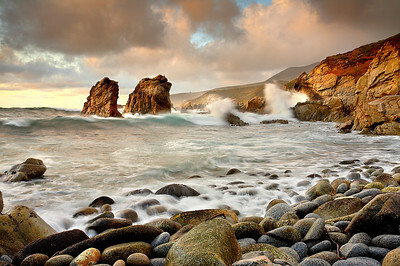 This stretch of coastline extends from Garrapata State Park in the north to Pfeiffer Beach in the south. Ocean waves, mist and light streamed through the portal in the Tafoni sandstone on a clear and warm January evening. Every once in a while, it would almost appear as though the light were striking the water, sending spray away from the impact point. I chose to step back to include some reflected light off the sand at low tide to add an added element of interest. 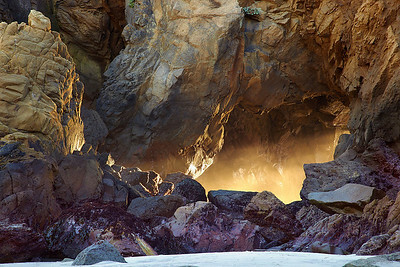 A sea cave near the main portal on this beach is also a great source of light during the winter at sunset. The sandstone and Tafoni rock formations have been sculpted into twisted formations while the waves have done their work to bore holes into the soft rock. It is as though the light was boring the hole on this evening as the sea mist drifted into the cave. 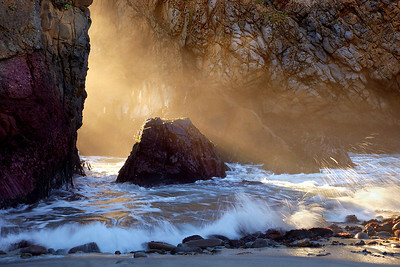 Sea mist and light streamed through an opening between two Tafoni sandstone sea cliffs at Pfeiffer State Beach, in Big Sur, California. This light does not last for long! A soft light met the pounding surf at the main beach in Garrapata State Park at the north end of Big Sur, near Carmel, California. I noticed the waves pounding this rock and focused on it for a while to capture the best views I could. #3 is the same composition with different movement in the water, which made a completely different picture. A soft light met the pounding surf at the main beach in Garrapata State Park at the north end of Big Sur, near Carmel, California. I noticed the waves pounding this rock and focused on it for a while to capture the best views I could. #2 is the same composition with sand in front, which made a completely different picture. 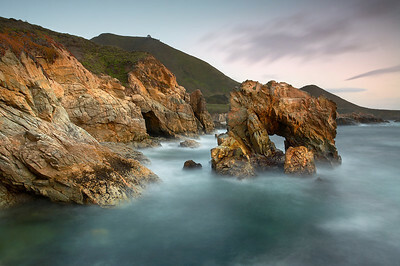 This little cove is one of many dozens of lesser-known and hard to reach places along the Bug Sur coast. It is heavily guarded by steep cliffs, and lots of poison oak, which produces a bad skin rash to those that are allergic to the oils in the leaves and stems. So I make sure to wash off with lots of soap and water when I get back. Especially since I wear shorts and water shoes and the leaves can directly touch the skin. Still it is well worth the dangers to get here. For me, long exposures work best when you have visually striking features that you wish to isolate and show off. So when I saw these colorful boulders and how they contrast with the sand and the different rock behind them, I knew to wait for the light to drop off so I could do a long exposure. The trick is to wait for a time when the water level is just high enough for the water to be between the rocks but not be completely covering them for very long. 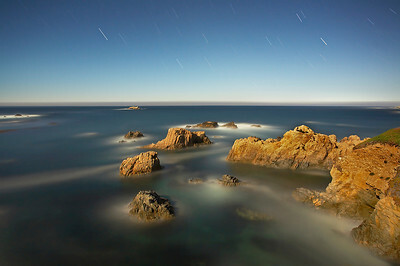 If the water is over the rocks for more than 10 second in a 60-second exposure the rocks get too soft. Also, I wait for periods in between big sets of waves. 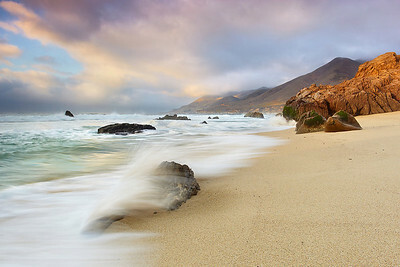 Smoother water (compared to 10 ft. waves) look better on long exposures. So, even on a 1+ minute exposure, timing is still important. Also, wait for the clouds to be streaking across the sky for that surreal effect. This rocky coastline south of Carmel is quite scenic and dangerous. 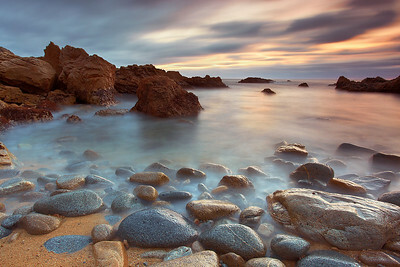 The lens was 20 feet above the water and soon after I made this image, I found out the hard way why the rocks were wet! I got in close to show the brief light show on the waves and the rock. It was difficult to get to this spot, as it required a scramble across a rocky cliff. Sometimes the best rock is the least accessible. The light played a big role on how the rock looks in this photograph. A few minutes earlier, the light was bright and harsh and the rock had less detail and color. And a few minutes later, the colors faded along with the light. It is easily possible to find a great spot with nice rock formations but still end up with a boring photo because the light was not right. Similar to but different than Garrapata Surf #1. 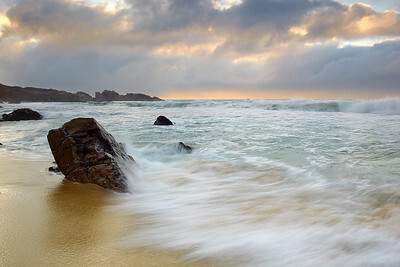 A large storm cleared out right at sunset on this beach south of Monterey. That stirred up some large waves and good cloud formations. I waited for over a year for these conditions with a medium tide and finally it all came together. Low tide cuts off the waves and high tide does not show the interesting cobblestones on the beach. 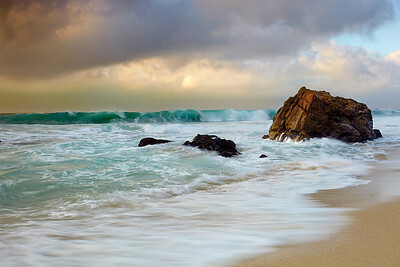 Once the conditions were right, it came down to capturing the waves at their most dramatic moment. 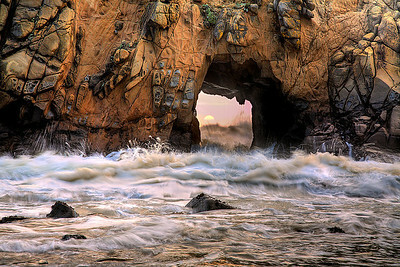 One moment (shown here) occurred as the waves struck the sea stacks. Another happened as the waves hit the cliffs behind. I made sure to capture both moments. Here, a 1/5 second exposure was enough to show movement in the fast moving water, while retaining detail in the slower moving water in the foreground. Too bad photographs cannot capture sound as an extra element. The cobblestones made quite an impressive sound as they rolled around in the large surf. 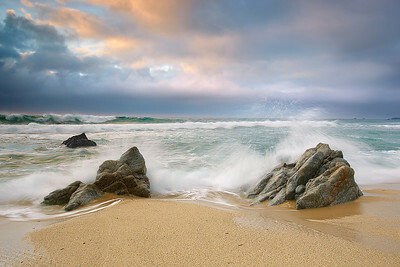 A large storm cleared out right at sunset on this beach south of Monterey. That stirred up some large waves and good cloud formations. I waited for over a year for these conditions with a medium tide and finally it all came together. Low tide cuts off the waves and high tide does not show the interesting cobblestones on the beach. 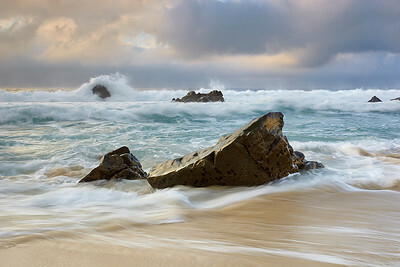 Once the conditions were right, it came down to capturing the waves at their most dramatic moment. 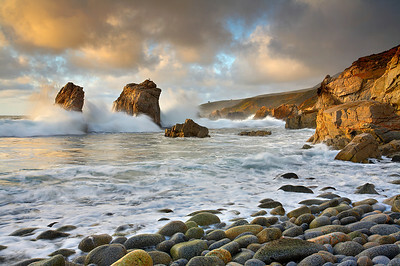 One moment (shown here) occurred as the waves struck the sea stacks. Another happened as the waves hit the cliffs behind. I made sure to capture both moments. Here, a 1/5 second exposure was enough to show movement in the fast moving water, while retaining detail in the slower moving water in the foreground. Too bad photographs cannot capture sound as an extra element. The cobblestones made quite an impressive sound as they rolled around in the large surf. 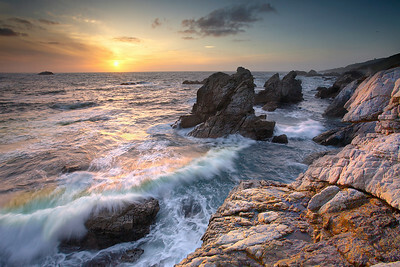 Soberanes Point, in Big Sur near Carmel California is a rugged piece of coastline backed by 4,000 foot mountains. I wanted to isolate this arch and give it a 3D look by doing a long exposure so that the waves do not distract from the rock forms. Also, it was isolated more when I made the top of the arch break the horizon just in one spot. I had to run across a low point in between waves to get out to a rock similar to the arch in order to get this composition. The coast was blanketed in a 2,500 foot deep low cloud layer, but this part of the Big Sur coastline bends to the east just south of Carmel allowing holes to develop in the fog. 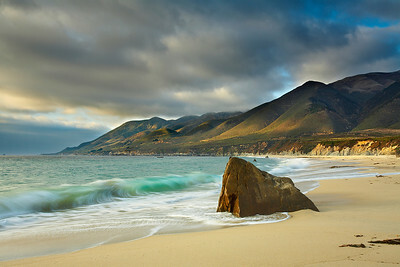 That allowed the light to cast itself across the beach and mountains one hour before sunset. I had originally planned to shoot at another location, but it was fogged in so I went to where the light was. I wanted to catch the waves just at the split second when the light shone through, revealing the color of the water. The angle of the light enabled the texture of the rock face and sand to show up clearly. The softness of the light allowed me to have the wave paint itself onto the image with an exposure time just long enough to show some movement without losing a sense of the direction of motion. A ½ second exposure would have looked rather messy and a 1/20 second exposure would have frozen the wave in place. 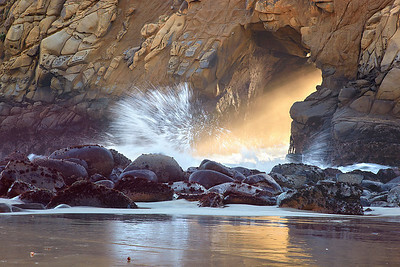 This opening in a cliff face at Pfeiffer Beach in Big Sur allows large waves to come through at high tide before a big storm. The waves often fill the entire portal to the top, and the portal becomes a giant water shotgun! The Tufoni formations in the rock are incredible and should be seen in person. The sun was only like this for about 30 seconds so I had to work fast. Fortunately, the sun was dimmed by high clouds but there was still enough light to reflect onto the rock face from the cliff behind the camera. Backlighting is crucial here; otherwise you have an overexposed portal with no detail on the rock face. Once the light was right, I waited for the water flow to become dramatic. A short exposure time allowed a little movement while retaining detail of the sea spray. I noticed the aquamarine-green color of the waves that appeared for just a fraction of a second in front of the dramatic sky. So I set up and waited until I had captured it just right. The sunlight tried to find gaps in the clouds, but turned them a glowing orange instead. I waited for the waves to strike the rock before making the exposure. Then I was hit, but that is the price that must be paid! Garrapata beach has many interesting stone formations, like this one right here. 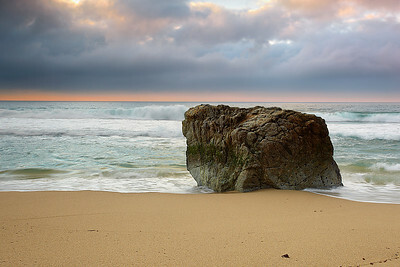 So I waited for the clouds and waves to form a pleasing background with this rock as the main subject. The clouds were getting dark and ominous, and that was a good backdrop to the powerful and chaotic surf. There was a full moon rising in the darkness over Soberanes Point in Garrapata State Park in Big Sur. I could see the moonlight on the water and how it cast shadows across the small islands of rock. This long exposure shows the stars in motion with the sky appearing nearly as though it was daytime. The fog in the distance moved onshore shortly after I was finished, so I was fortunate to capture this scene. Even though it was nighttime, my eyes became accustomed to the low light and I was able to see the deep blue color of the sea. The shimmering waves took on mystical properties as I sat alone on the rocky outcrop where I had placed my tripod listening to the waves and the coyotes. It was the mystical atmosphere that I hoped to capture on this night. These sea stacks in Garrapata State Park are constantly battered by large waves in the winter months. 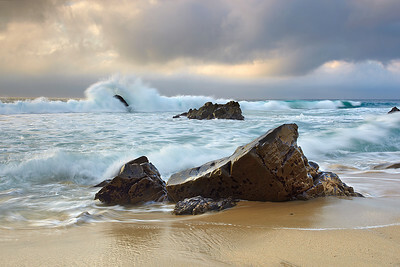 They make great subjects either by themselves or as part of a wider seascape image. The seventh in a series. A soft light met the pounding surf at the main beach in Garrapata State Park at the north end of Big Sur, near Carmel, California. This is looking north towards Carmel and Monterey. This state park could definitely be one of the most scenic national Parks in the US if it were designated as such!